What could be better than a room full of people who care about making change in their communities? 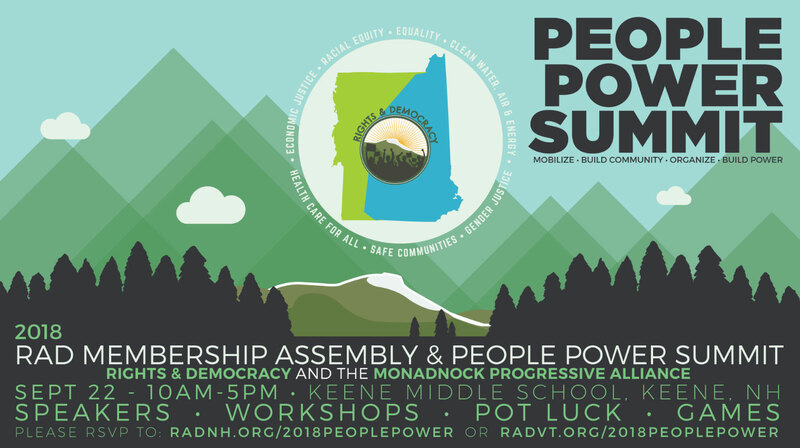 Join Rights & Democracy (RAD) and the Monadnock (NH) Progressive Alliance (MPA) for the bistate RAD Member Assembly and MPA People Power Summit on Saturday, September 22! We’ll be gathering at the Keene Middle School, in Keene, NH, and everyone who believes in our work is welcome, whether or not you are a current member. Give awards to members who have been integral in building our movement. Attend two workshop blocks related to skill building and action strategies. Keep watch in your inbox and on RAD’s social media for details about these amazing workshops and other special details about this important annual assembly. As a member, you can run for the Board of Directors. Contact Alison Nihart at alison@radvt.org to learn more about this opportunity. Donate online, or send in a check to Rights & Democracy, 70 S. Winooski Ave, #205, Burlington, VT 05401. Suggested membership is $120 annually/$10 a month. All donation sizes welcome. Give at the level you can. Thank you for your support of building the progressive movement in New Hampshire and Vermont! See you on September 22 in Keene! There will be an after party at Margaritas in Keene as well. Join us for the entire day or for the parts of the program you attend!